This full moon is a super one - falling in the middle of March, on the Vernal Equinox/First Day of Spring. Without getting in the weeds, and given I am not an astrologist, nor well versed in cosmology…through my own spiritual journey I’ve come in to relationship with the lunar cycles and hope to inspire you to do the same. In American culture we follow the Gregorian calendar, a solar calendar, which starts a new year every January 1st at 12am. The lunar calendar doesn’t work like this but cultures across the globe still abide by this ancient, nature based time keeper. The lunar new year starts on a different date each year, depending on when the moon is new in relationship to the previous year’s new moons. Each lunar year has thirteen lunar cycles (new moon to new moon). Cultures around the globe have recorded time this way for millennia. Comparing the Gregorian calendar to the Lunar calendar causes some confusion. For example, this present full moon is the Egg Moon in the solar calendar and the Sap Moon in the lunar calendar. This gives us the opportunity to use our intuition to determine what feels right for us. For some people, like those who live in warmer climates, may find themselves more aligned with the time of the Egg Moon. Whereas people like me, in a colder climate, find ourselves honoring the time of the Sap Moon. Outside, it is time to harvest the sap of the trees, the snow is melting, the birds are singing louder as the days grow longer. You can learn about my spring rewilding rituals here. This year, I wanted to reestablish my full moon practice. I used to have a lovely ritual including meditation, tarot, crystal charging, and self-care practices. As I’ve gotten older, my schedule has gotten full with dog walks, kitchen chores, work meetings, and the like. I’ve struggled to keep up with the perfect full moon practice so I needed to find one that worked for me. 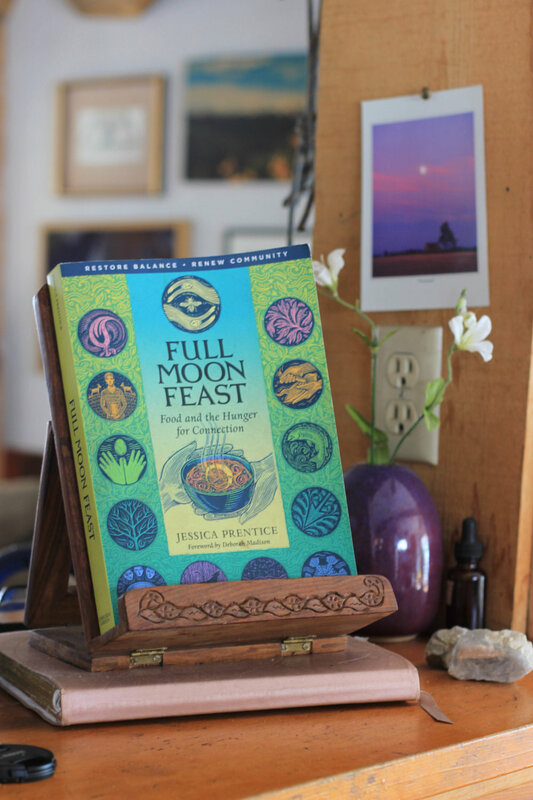 I dusted off one of my favorite cookbooks, Full Moon Feast by Jessica Prentice. This month I’m sharing my favorite soul nourishing drink, hot chocolate. I drink raw cow milk from a certified organic family farm in southern Idaho. Swap whichever milk you favor most. I warm in a small saucepan, whisking in cacao and maple syrup, until well blended. Never bring to a boil to preserve nutrients in the raw milk. Enjoy with gratitude and intention for the nourishment provided by our Earth. Spring is a time many traditions, most notably Ayurveda, recommend to cleanse the body of toxins. This practice aligns well with the abundance of fresh spring herbs like dandelion, cleavers, and nettles. Cleansing may be a great option for you. An easy, gentle choice could be adding bitters into your daily wellness routine. My mother is a home herbalist and gifted me these bitters, containing orange pith & peel, nutmeg, allspice, cinnamon and other bitter herbs. I take a dropper full of bitters on my tongue about 20 minutes before a meal. This helps to stimulate bile flow, boosting digestion and elimination. The bitter flavor is getting much more press lately and I’m definitely a believer! Check out what Dr. Mercola has to share about bitters. I encourage you to make your own bitters or inquire with your local herbalist. … or garage…or office…or car…or whatever place you feel overwhelmed with stuff. I like Marie Kondo’s method and have been slowly applying her practices all winter. I just purged my closet and it felt pretty damn good, but I didn’t do it the Kondo way. Maybe next time. Plan ahead for next time. Okay, it’s too late to do it this time but if you’ve found yourself frustrated by missed connections, issues with contracts, or bad purchases, you may not be feeling the flow. I try to schedule my life to be more inline with nature’s rhythm. I’d probably avoid a relocation for a new job during mercury retrograde, or ask for a big raise via a Zoom meeting, or jump in to a new business venture. I definitely like to tie up loose ends with paperwork, but not start new projects like taxes. This year, I had my taxes filed and paid before March 1st. I did that on purpose, not necessarily because I’m completely on top of my finances. It did, however, allow me to see my financial situation more clearly and plan ahead for next year. I’m committed to paying my quarterly taxes to avoid the big check every spring while keeping better track of my business expenses using Quickbooks for Self-Employed. I’m not the only one who paid more in taxes than Amazon, right? I have a few podcasts I tune in to deepen my connection with the lunar cycles. I’m a mountain town homesteader, community food system strategist, seed saver, and storyteller. My life’s work is to promote honorable exchange in our homes, communities, and the marketplace. I hope this site inspires you to join in on the path to conscious consumerism. Receive occasional updates via email.